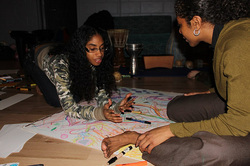 Creation Stations can be found at every Artist Ashram. The experience is fully interactive. 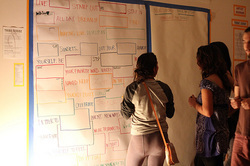 Each participant will be presented with several stations. In each station you find an expression of art. The beauty of these stations resides in their collaboration. During this writing and performance session, participants will cultivate their creativity with and beyond structure through cooperative games and exercises. We will free our flow of imagination, open up our minds and speed up our expression. We will write, speak, compose and improvise to nurture inspiration and empower innovation. During this movement and dance session, participants will deepen their kinesthetic sense experience, relationship to gravity, compositional awareness, physical listening and communication skills. We will cultivate our improvisational intelligence and presence through performance practices, composition exercises and dance improvisation scores. 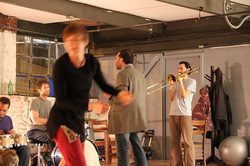 Participants will move and watch, collaborate and solo, improvise and choreograph/score their movement. We will open up and explore our imaginations, senses and impulses as resources for our movement, opening up our minds and allowing our expression to be immediate. Grab a canvas or sheet of paper and start your own personal artistic expression. Music is a process of letting go, while constantly listening, to our selves and to others in the space that we share. In the tribe vibe, we explore these moments of connection with sound as we watch it flow and connect with the art, writing, dancing, and observed forms and structures in this world. 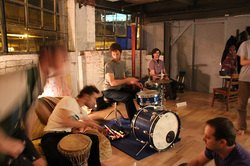 Participants are asked to collaborate musically as a team in ways which they may have never done before. Playing new roles musically. Start with simple rhythms, percussive elements and voices.